Enjoy the warmth and beauty of solid Acacia hardwood outdoor furniture that you can enjoy year round. The SOLITAIRE 7 Pc dining Set is designed backyards. Hinged tabletop folds flat and the folding chairs store within the table frame when not in use. Made with acacia wood with water-resistant properties that makes it suitable for outdoor use in Canada. The 61 inch length x 40 inch width x 29 inch high tabletop makes a stunning focal point. Six durable folding chairs complete the dining set and when not in use store securely in the table frame. The SOLITAIRE 7 Pc Dining Set is designed for modern backyard living. Table dimensions: 61" x 40" x 29". Table top folds flat to a compact 8" width when not in use. Includes six folding chairs that store securely in the table frame when not in use. Enjoy your outdoor space with the Hampton Bay Megan Seagrass patio furniture set made with beautifully hand-woven wicker and durable steel furniture frames. The patio chairs boast deep, plush weather resistant cushions for ultimate comfort and longevity. The faux wood dining table has a slat-top surface. Perfect for your porch, patio or sunroom, each patio furniture set includes six dining chairs and one dining table. Create a personal paradise right in your own backyard. This Cabana All-Weather Wicker 7-Piece Rectangular Dining Set is both sturdy and stylish. The soft back dining chairs are richly woven in a half round woven wicker which is weather-resistant and has a natural colour and feel. The seat pads are upholstered in waterproof Sunbrella Cast Ash which protects against moisture build up while providing UV resistance for any outdoor use. This set includes 6 dining chairs and 1 rectangular dining table. 7 Pc New York Fly Dining Set Enjoy the warmth and beauty of solid Acacia hardwood outdoor furniture that you can enjoy year round. 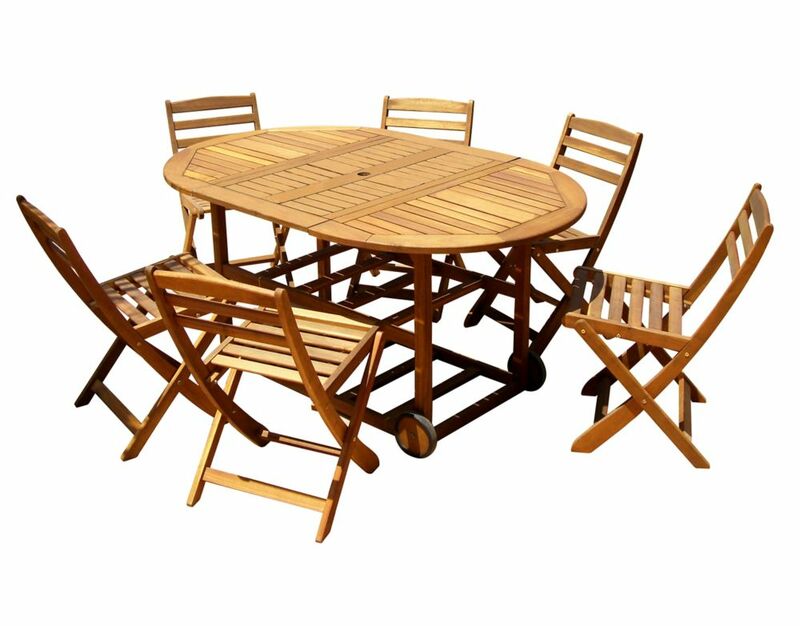 The SOLITAIRE 7 Pc dining Set is designed backyards. Hinged tabletop folds flat and the folding chairs store within the table frame when not in use. Made with acacia wood with water-resistant properties that makes it suitable for outdoor use in Canada. The 61 inch length x 40 inch width x 29 inch high tabletop makes a stunning focal point. Six durable folding chairs complete the dining set and when not in use store securely in the table frame. The SOLITAIRE 7 Pc Dining Set is designed for modern backyard living.